The drainage project starting next month on the uppermost end of South Claiborne Avenue will gradually extend downriver to Lowerline Street over the next five years, officials said Thursday evening, and Hollygrove residents worry that it will increase, rather than reduce, flooding in their neighborhood. 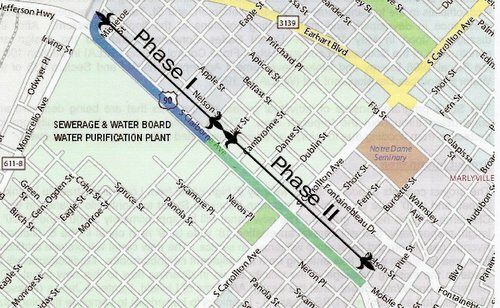 The Sewerage & Water Board and the U.S. Army Corps of Engineers are building a major new drainage canal under South Claiborne that is expected to commence with utility relocation next month near Monticello Avenue and the Jefferson Parish line, officials said at an information session in the Carrollton community. The first segment of canal construction will then begin in April, followed by a second segment that starts in August, a third in January 2013, and a fourth, final segment in May 2013. That entire $27 million stretch — from Monticello to Leonidas Street — is known as Phase 1, and will wrap up in August 2014. However, there is a Phase 2, which runs from Leonidas to Lowerline. The Phase 2 contract is expected to be awarded around April, with construction starting next year at the Lowerline end, and working back toward Leonidas in a similar segmented fashion, said Ron Spooner, head of the SWB drainage engineering department. The entire project will be done in 2016. Construction will largely focus on the neutral ground and the westbound lanes, so traffic will be shunted around work sites (likely to be only a few blocks long at a time) into what is now the downtown-bound side of South Claiborne. Two lanes will remain open in each direction. Meanwhile, on the side where work is being done, a “local traffic only” lane will remain open for vehicles that need to access specific homes or businesses. The new canal is intended as part of the $1.5 billion SELA project, which for the past 15 years or so has been working to protect Uptown (as well as parts of New Orleans East and the Lower Ninth Ward) from flooding caused by what officials call a 10-year flood event (a rainstorm of a strength that’s only 10 percent likely to happen each year). But the audience of several dozen residents at St. John Baptist Church on Panola and Leonidas seemed more concerned about the potential flooding the project could create by overworking the Monticello canal. The new Claiborne canal won’t actually be collecting more water, officials replied; it will just be moving it through more quickly. Monticello will still only drain water from down to around State Street, while the Napoleon canal will continue draining water from beneath that point. Computer models show that the water from the 10-year storms that the project is designed to handle won’t overtop the Monticello canal, they said. That explanation did little to assuage Vanderson’s concerns. “You’re trying to make us into a retaining pond,” he said. “The entire area is a bowl, so we’re all in a retaining pond,” Spooner replied. Vanderson and other residents also wanted to know why a wall could not be built along Hollygrove section of the Monticello canal. Officials replied that a wall would actually prevent water from draining out of the community. Officials conceded and apologized for one mistake, failing to alert the public before trees in the neutral ground were cut in preparation for the project. At the audience’s request, SWB officials pledged to do a better job of communicating shifts in traffic patterns and low water pressure during the project.